Biography: Kareena Kapoor is a Bollywood actress born to veteran actors Randhir Kapoor and Babita. She took on the name Kareena Kapoor Khan after her marriage to actor Saif Ali Khan. She is the younger of the two daughters, Karisma Kapoor being the elder. She made her Bollywood debut with Refugee in 2001 opposite Abhishek Bachchan. Having played a variety of roles that range from contemporary. Born in Mumbai , India, on September 21, 1980, Kareena is the second daughter of actors Randhir Kapoor and Babita (born Shivdasani). Her elder sister Karishma Kapooris also an actress accomplished in the Bollywoodindustry. She is the granddaughter of actor and Director Raj Kapoor, great-granddaughter of the actor Prithviraj Kapoor. According to Kareena, his name comes from the book of Anna Karénine, his mother was reading when that she was pregnant with her. The nickname of Kareena is Bebo, its origins are Punjabi on the side of his father, and Sindhi on his mother’s side. 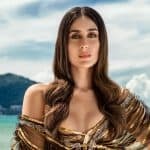 Kareena Kapoor said admire actresses such as Nargis and Meena kumari, after the separation of his parents, Kareena has been high by his mother in the residence of Lokhandwala has Mumbai to the along with her sister Karishma which it is very close. Kareena studied at the Welham girls Boarding school, Dehradun in Uttarakhand after having had the equivalent of the bin, Kareena studied law at the University of Churchgate in Mumbai, however, Kareena decided to put an end to his studies and decided to become an actress. She will be trained at the Institute of cinema and television in India. If you follow Indian cinema, Kareena Kapoor needs no introduction. If you are not from India or don’t follow Indian cinema, here’s a brief bio. Kareena Kapoor hails from the first family of Indian cinema and is a fourth-generation movie star. She has impeccable pedigree and a sterling track record of performance. She is India’s highest-paid actress and she was the lead actress in 3 Idiots, the biggest ever Indian blockbuster. Some of her most iconic performances include Kabhi Khushi Kabhie Gham, Chameli, Jab We Met, Kurbaan. She is the face of several top brands including Airtel, Anne French, Chronotech, Gitanjali, Head & Shoulders, Kurkure, Sony Ericsson, Sony Vaio, Vivel de Wills.